Langley – After five years of service, Ed Townsend (Grove), closed out his tenure on the Grand River Dam Authority Board of Directors during the board’s August 8 meeting in Langley. 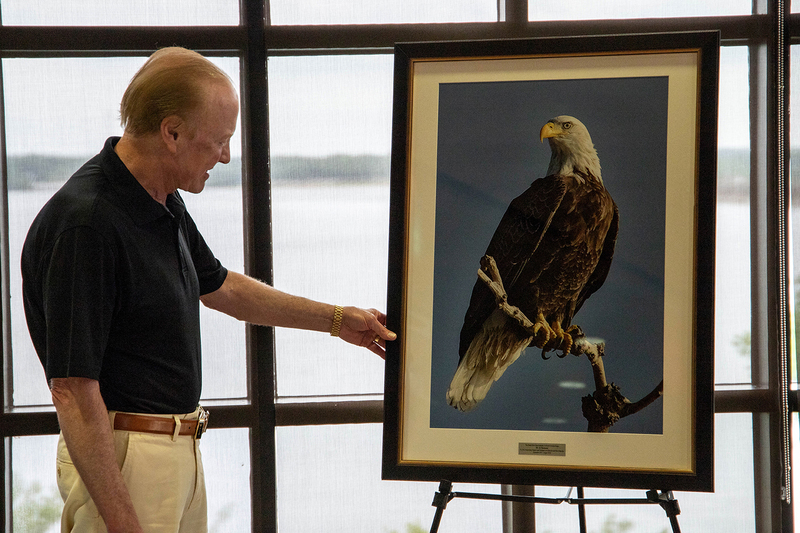 Outgoing GRDA Director Ed Townsend admires the Grand Lake eagle print presented to him during the August 8 meeting of the GRDA Board of Directors in Langley. Townsend, who served as GRDA Chairman in 2015-16, is ending his tenure on the board after five years of service. Townsend, the founder, owner and chief executive officer of Bank of Grand Lake, was appointed to the GRDA Board by Oklahoma Governor Mary Fallin in September 2013. He served as GRDA Chairman in 2015-16 and throughout his tenure helped lead the board’s audit, finance, budget, policy and compliance committee. Townsend’s leadership of GRDA was critical during a significant period as the organization enhanced its electric generation portfolio with additional wind generation, state-of-the-art emission controls on its Unit 2 coal generator and the construction of its new ultra-efficient Unit 3 combined cycle gas plant. GRDA Chairman Joe Vandevier echoed Sullivan’s sentiments about Townsend’s value to the board. Governor Fallin is expected to name Townsend’s successor soon.